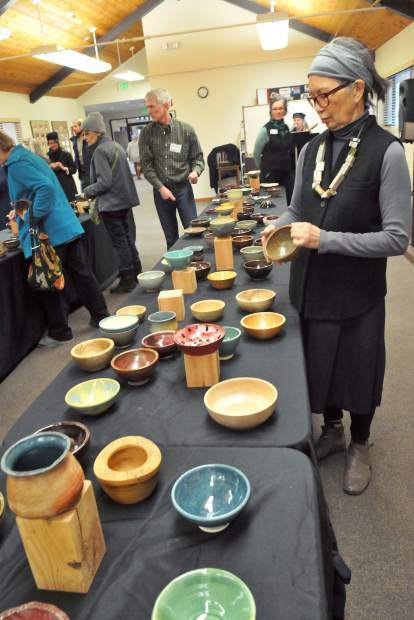 Karen Tanake looks for the perfect bowl to pick during Saturday's 12th empty bowl at Peace Lutheran Church in Grass Valley. Over 90 gallons of soup were made for the fundraiser to benefit Hospitality House. The bowls were empty, but not for long. Soon after the doors opened Saturday, a helping of soup prepared by area eateries and individuals offered some warmth and nourishment at the 12th Empty Bowl to benefit Hospitality House and the region’s homeless. Over 90 gallons of soup made its way into Peace Lutheran Church in Grass Valley for a sold-out lunch and dinner, where people sat in solidarity with one another in recognition of the need to help address homelessness in Nevada County. Testimonials from area homeless people praised Hospitality House and its efforts to get people back on their feet.